We’re offering a fun new class at TCFA—Learn to Decorate a Beautiful Cake! 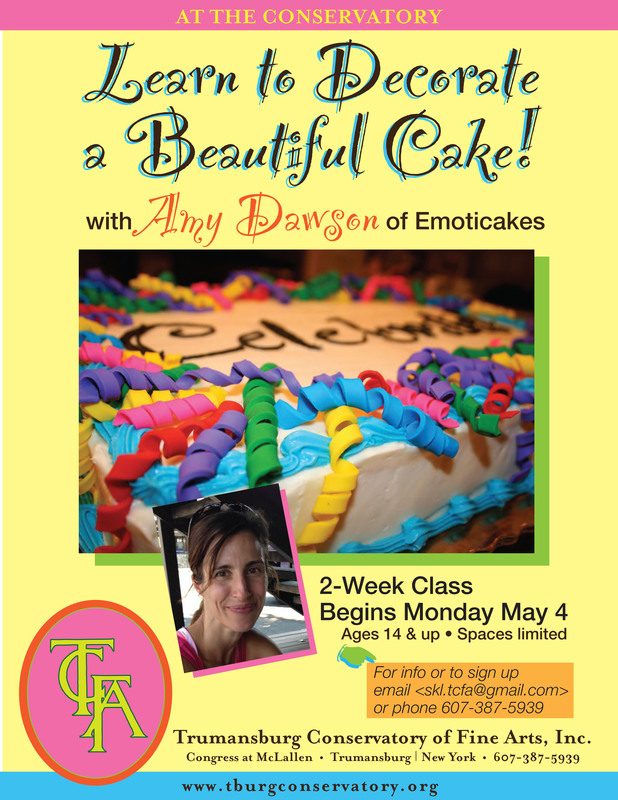 Class begins on Monday evening, May 4, 6:30-8:30pm, led by Amy Dawson, the Cake-Boss of Trumansburg’s own Emoticakes. Participants will learn how to prep a cake for decorating; how to make borders and write on a cake in frosting; how to use fondant; and how to sculpt beautiful roses. Get your skills tuned up in time to make a great Father’s Day cake! A Graduation cake! A cake just for the fun of it! No prior experience is necessary. The class is open to ages 14 and up, and will run for a total of four sessions: Monday, May 4, Thursday, May 7; Monday, May 11; and Thursday, May 14. The fee is $55. It’s important that you contact us about signing up, because there is a small list of supplies to be gotten. For more info or to register, please e-mail <skl.tcfa@gmail.com> or phone 607-387-5939.